Microsoft Edge has been revealed as the official name for the new browser from Microsoft. Formerly known as Project Spartan, Edge will soon be the default browser in Windows 10. 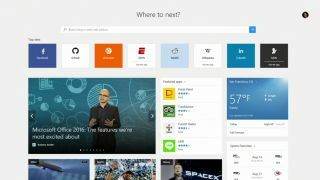 During Build 2015, Microsoft said that it's optimistic the design will help people find applications easier, especially with the integration of Cortana. The company's Halo-inspired voice assistant will be baked right into the new web browser for easier search and other tasks. Microsoft's VP of Operating Systems Group, Joe Belfiore said of Edge: "[The name means] the edge of consuming and creating, being closer to the modern capabilities of the Web. This is for note-taking, reading, and consuming content. Developers will care about the blazing fast speed and that it is a universal app." Web extensions will be added to Edge and will run universal apps that will supposedly save you more time. Belfiore said these extensions could be ported from browsers like Chrome and Firefox with "just a few modifications." Our hands on with an early version of the Windows 10 browser wasn't exactly superb, so we're hoping that along with a new name, Edge will have its rough edges smoothed out by the time it launches this summer.